Putting up packages of fruits and vegetables when they are ripe from the farm share means that I can pull them out in the middle of winter and feed my family from the farm share all year 'round. I had buttermilk and was in a waffle mood. A long time ago, while watching the Food Network, I'd written down Alton Brown's waffle recipe. I love his Wet Team and Dry Team talk. When I got to the "just walk away--walk away" part of the recipe (let the batter rest) I decided to take him literally. We took the dog for a walk! But before we did, I got the idea to set a package of roasted butternut squash on the counter to thaw, snap a photo, and write a note to the <sleeping> kids to fix a fruit salad when they woke up. We came back from our walk and the kids had woken up. My daughter's fruit salad came mostly from berries we'd put up when they were in season (49 cent pints of blueberries, anyone?) along with a Band Fundraiser oranges and grapes. I preheated the waffle iron, stirred the thawed squash into the batter, and we enjoyed tender, fluffy, flavorful waffles with a fresh fruit topping. In a microwave safe large bowl, nuke the butter until it's nearly melted. Set aside while you gather the rest of the ingredients. When the butter is slightly cooler, mix in the buttermilk, eggs, and vanilla. Stir in the squash. Stir until thoroughly combined. Stir to combine. Then take the dog for a walk, or surf the internet, or find something enjoyable to do for 30 minutes to an hour. Preheat a waffle iron, and cook waffles according to manufacturer's directions. If you've got an ancient waffle iron like my mom does, keep a fire extinguisher handy because that thing is just unsafe! I got my waffle iron for Mother's day (along with a food processor, I was thoroughly spoiled) and stereotypes aside I love both gifts and love blessing the family with goodies using such wonderful tools. This post is linked with the Farmgirl Friday Blog Fest at Let This Mind Be in You, What's Cookin' Wendesday at Buns In My Oven, and What's In The Box at In Her Chucks! These look amazing! I'll try them soon. I have 3 butternut squashes from my farm share sitting in my produce bowl (I got 2 of them today). It's time for some roasting. Annemarie, I think you've friended FFF on FB so you saw the pizza crust, think about shredding one of those butternut squashes! This waffles looks like heaven. I've been a little under the weather and as a result nothing (food wise) sounds good to me. Until I saw this. Delicious. I hope you feel better soon. Too much rice and beans? Perhaps a smoothie will help perk you up. I love waffles! And I have a few packages of acorn squash and Australian butter squash in the freezer. Going to have to try these soon! Thanks for posting! Australian butter squash--I'm intrigued! Please let me know how it turns out. Thanks! They were delicious. I could eat waffles for dinner now if I didn't have chili on the brain. And, conveniently, on the stove! Oooh, these look just wonderful! I don't own a waffle iron + often think I should get one ... especially right now. These would make such a fantastic weekend breakfast, especially with a fresh fruit salad. MMMM! Until last May when I got my new one, I'd been several years without a waffle iron. I tried to convince myself that it was ok, that life with pancakes and french toast was an adequate substitute for life with a waffle iron . . . but I was just fooling myself. 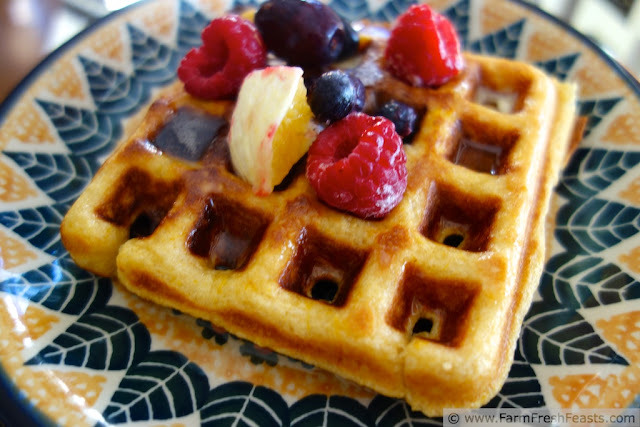 I just had to check this out when I saw the link for butternut squash waffles-- I love butternut squash, have two of them among my assorted winter squash waiting to be used, and could just imagine how sweet and golden butternut squash waffles would be. I must say they look as good as I imagined in the picture. I have a waffle iron in the recesses of the cupboard-- I should dig that out this winter and give these a try. 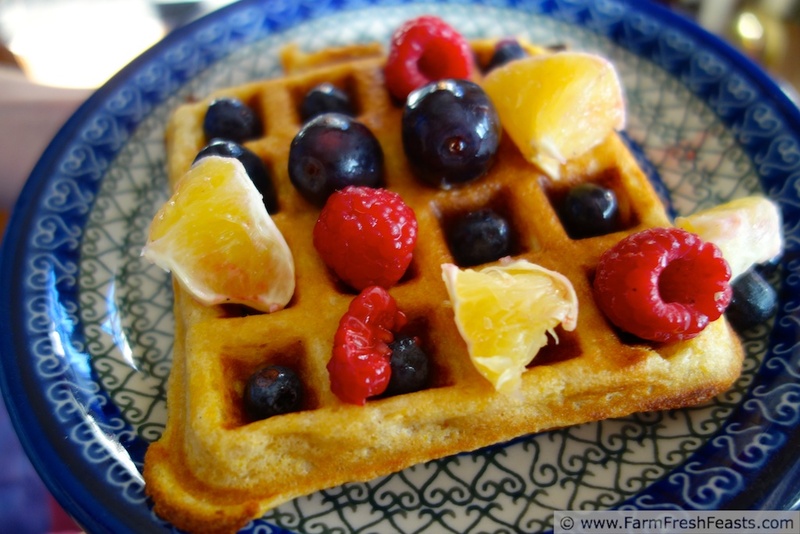 Do dig out your waffle iron and make use one of your squashes! I'm experimenting with butternut in pizza crust now, because the color just seems to work together. I am definitely going to try this! 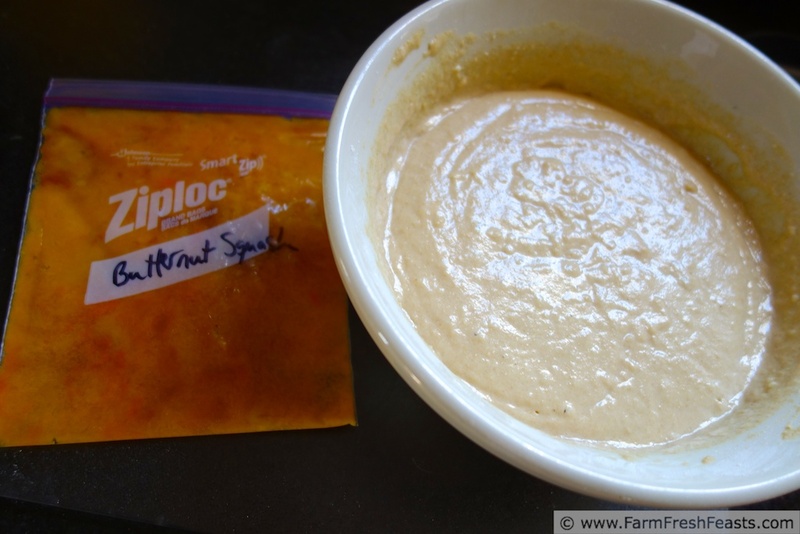 I have frozen butternut and kabocha squash from my fall CSA - perfect! Beautiful picture too. Melissa--Freezing! A great idea. Did you roast first and freeze the puree, or freeze cubes, or what? I'm starting to get a bit of space in my freezer, now that I'm chipping away at the Fresh Tomato Pesto that I put up after I read Heather at In Her Chucks' Cherry Tomato Pesto recipe. I've been experimenting with shredding the squash, but I'm wondering about freezing raw cubes vs cooked puree. Lucky you to get kabocha in your CSA! Another pin! You're making me hungry! Pin away! I'm constantly thinking about food and started drooling while checking out the blog fest so I'm glad to return the favor. This sounds great! I'll have to give it a go. I really love squash. I love this squash because I paid for it and it's sitting in the Strategic Winter Squash Reserve . . . well, not really, I do think it tastes pretty yummy. But if it weren't coming into my kitchen in my CSA farm share I don't know that I'd be frantically shoving it in any food wanders through my kitchen! But eating *more* vegetables isn't a bad thing, so I am grateful for the opportunity to do so. Ooh, those look delicious! Nice job planning ahead -- lovely to have those berries ready anytime you want them. I couldn't pass up such a good deal on blueberries--in season so they taste like a blueberry ought to taste, you know? My daughter loves to eat them straight out of the freezer, so I hope they last until June. This is killing me, because I'm totally in a waffle mood! 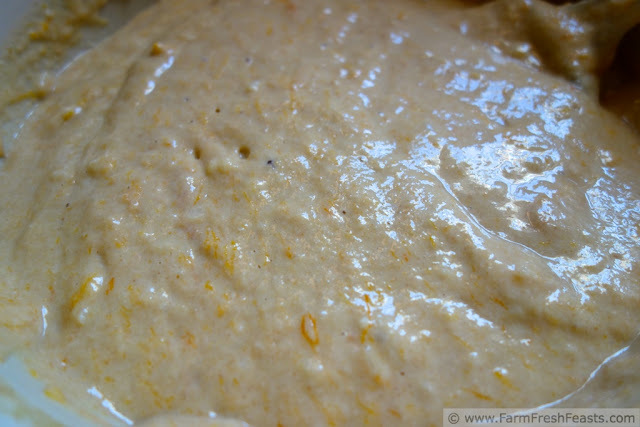 I love the idea of stirring butternut puree into them - I am so trying that next time. Lovely! I'm going a bit nuts with sticking squash in all sorts of places. I started to write weird places but didn't want to convey the wrong idea. It's all food related on this blog. Butternut squash shreds in a pizza crust, anyone? Please dig out your waffle iron by July--I just made a sweet corn and blueberry waffle that is really delicious and a must make. I just love him saying 'walk away'! That makes me giggle every time. I also love Alton Brown, but even he wouldn't be reative enough to come up with this variation. Love it! Alton would totally be creative enough--that man is a genius. Mine turned out a bit mushy. How do you get them to be crispy? I'm sorry that happened. Mushy waffles are no good. I tend to cook my vegetable-laden waffles a bit longer than a plain buttermilk waffle. For me, that means sliding my 'waffle doneness' control on my waffle maker a bit to the right for a more well done waffle. When I first take them out, they are softer than a classic buttermilk waffle, but after a couple of minutes on a cooling rack mine firm up. I also tend to store the cooked waffles in a preheated (250 degrees Fahrenheit) oven while I'm making the whole batch, before we all sit down to eat, and that probably helps.